“Special” is what someone says when they don’t know what else to say. “Awwww, isn’t that SPECIAL!” Hmmmmm. So, when someone calls your cat special, now you know what they really mean. I didn’t know what else to call this oatmeal, so I named it Special Oatmeal. 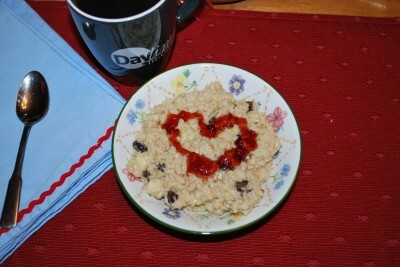 Yes, I could have called it Valentine Oatmeal, but it’s not…..you could make it any day of the year. I just snazzied it up for this holiday. I like snazzing things up. I don’t do plain. 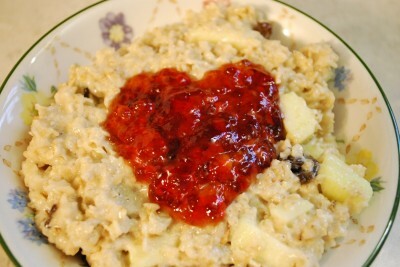 Let’s fall in love with oatmeal! 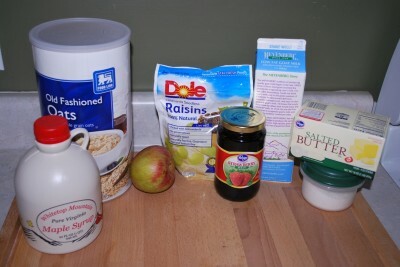 You need maple syrup, oats, an apple, raisins, strawberry jelly, milk, butter, and salt. 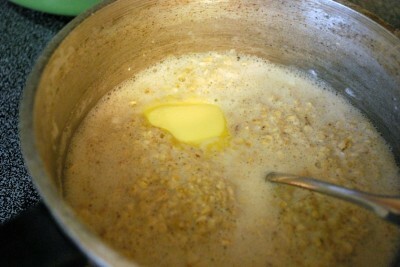 Now, you want to use quick cooking oats. 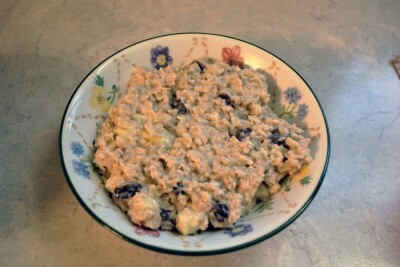 Yes, I realize that my picture has Old Fashioned Oats. Want to know the secret behind that? I refill my canister from the oats downstairs. Secrets unraveled at Humorous Homemaking! Oh, and you don’t necessarily need strawberry jelly – just a red flavor. 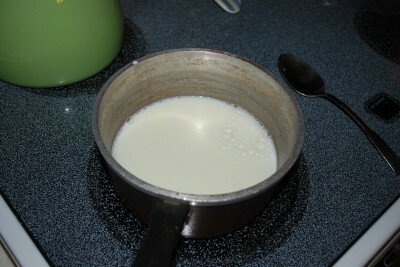 Grab a small saucepan and pour your milk in there. 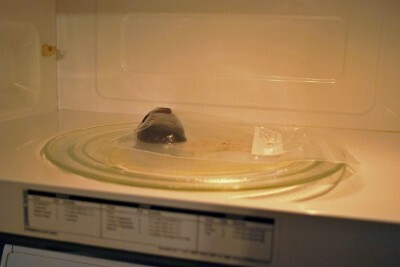 You need to heat it to boiling. I used goat’s milk. Why? Well because I saw it at Kroger and wanted to try it. I hate regular milk, so I thought this goat’s milk thing would just knock my socks off and I’d fall in love. Um, no. It’s just as nasty as regular milk. Sorry Mr. Goat. 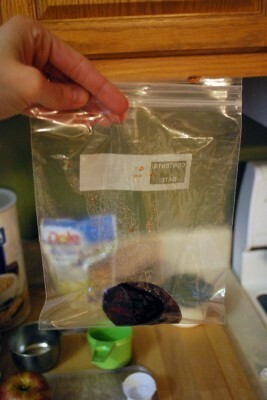 While your milk is heating up, put a big glob of jelly in a Ziploc bag. I think this was 2 tablespoons and I had a tad too much. But really, is there such a thing as too much jelly? Let’s be honest. For heaven’s sake, please don’t close up the bag. I don’t want to be responsible for jelly explosions all over the U.S. Thank you. Warm it up until it melts. I think mine only took 30 seconds. It should look like this…..almost runny. If there are chunks left, nuke it again. How do you say nuclear? I say it just like George Bush. Didn’t used to…….but now I do. Funny how things get in your head like that. I also now have issues saying OXYGEN because my mother-in-law saw OX-GA-GYN. 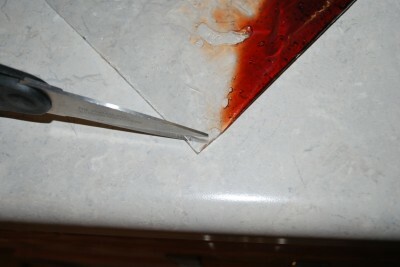 Oh, and if it’s jam there are going to be chunks because of the fruit so make sure you use jelly for this. Hope I didn’t tell you that too late. Holy cow! My milk is boiling and getting all foamy. Calm down Mr. Goat! Time to add the oats and give them a stir. You need to cook them until they start to get thick. It won’t take long at all, just a couple minutes if that. And because I love Paula Deen, add butter. Yes, just do it. Salt too. 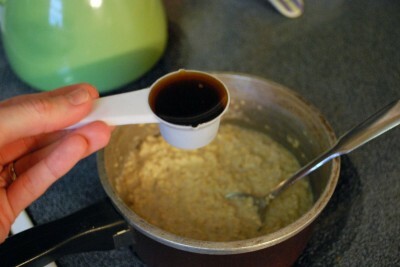 You can use whatever sweetener you’d like, but trust me…..maple syrup really makes this oatmeal shine. It gives it a lovely flavor…..and I just like syrup. The real stuff. I get it and only use it to cook with because I hate to waste it on my pancakes. Ha, ha! I let Barry use it sometimes……if he’s been nice. Add it when your oats get thick. 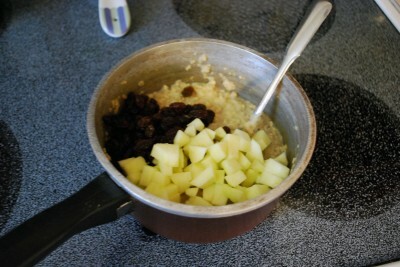 I peeled and chopped an apple and tossed it in there – yes, crunchy. It was a nice change. I think you’ll like it too. Oh, and raisins. I need to up my fruit intake….no, not really but it sounded good didn’t it? 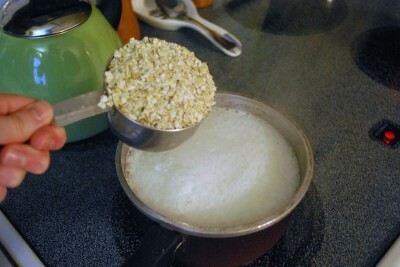 Divide the oatmeal between your bowls. Look how sad, lonely, and plain it looks. Don’t worry baby! I’ll fix you! 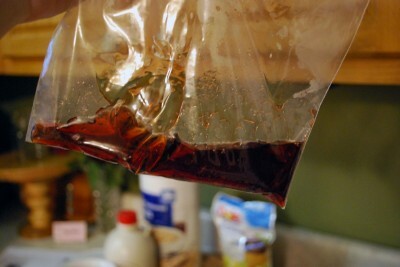 Grab your Ziploc Jelly and snip the corner off the bag. Make sure it’s really small so you can write with it. If it’s a large hole, you’ll just get a big blob of jelly on there. Cute, but not festive. Draw a heart using the bag and jelly. How cute! I have some mad piping skills y’all. Just look at that. I need to go on Ace of Cakes. 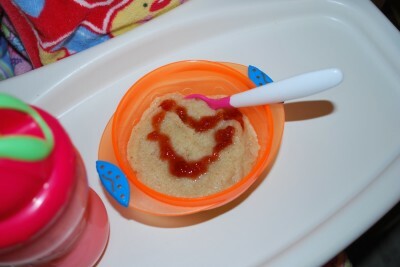 Annie was having Cream of Wheat instead, but I did make hers “special” too. I can’t leave out my baby. There you have it! A special Valentine’s breakfast that you can make any day of the year – just leave off the heart – unless you’re feeling particularly lovey that day. 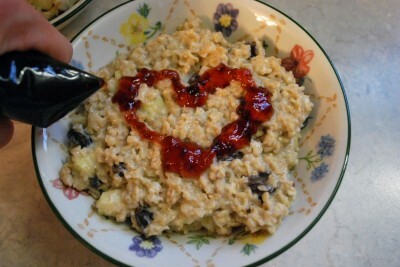 I LOVE OATMEAL! This is the best page, I can’t wait to try your whipped banana oatmeal!